Smart coatings material possess the ability to alter their properties as per the environmental stimuli for instance electric field, temperature, and others. The smart coatings market is gaining momentum with new emerging technologies such as conductive materials, nanotechnology, self-healing and assembling system, and microencapsulation. With the rising importance on research and development activities, the market for smart coatings is boosting up owing to the eco-friendly and lightweight properties. Smart coatings are also help to find damages on an oil and gas platform, aerospace engine, or a composite which saves weight on an airplane. Owing to these characteristics, the smart coatings market is adopted by industries such as aerospace, military, automobiles, hospitals, and others. This is one of the major factors driving the demand for smart coatings and thus enabling manufacturers to invest in this market. The report published by TMR stated that irrespective of its high cost, the smart coatings market is still expanding due to its numerous benefits. The global market for smart coatings cloaked expansion by exhibiting a strong CAGR of 29.8% during the forecast period. In the year 2016, the smart coatings market was valued at US$1.1 billion and is estimated to hit US$9.82 billion by the end of 2025. Based on the application segment of smart coatings, the market is divided into automotive, military, construction, medical, and electronics and many others. Among these, the military segment dominated the market in the year 2016 on the account of increasing smart coatings demand from Europe and North America. The market for smart coatings is increasing rapidly in the automotive segment as they improve the asset life by reducing corrosion damage and maintenance costs. The construction segment is also booming in the market and is estimated to grow at a market share of 2.3% by the end of 2025. Based on product-type, the smart coatings market is divide into self-healing, self-dimming, self-cleaning, anti-bacterial, and anti-corrosion. Presently, the anti-corrosion product type is dominating the market on the account of increasing demand from regions such as Europe, Asia-Pacific, and North America. The anti-corrosion applications are majorly used in industries such as military, electronics, automotive among others. As per regions, the global market for smart coatings is spread over Asia Pacific, North America, Europe, and Middle East & Africa. North America leads the smart coatings market covering the highest share in terms of revenue. The growth of North America is rising due to the rapid infrastructural developments in various industries such as consumer electronics, military, automotive, and healthcare. It is also anticipated that the market in this region is going to lose some portion of its revenue share by increasing at a CAGR of 25.8% during the forecast period. Europe is also estimated to cut down on its share by exhibiting a CAGR of 26.2% by the end of 2025. In terms of growth rate, Asia Pacific is likely to be the strongest over other regions by exhibiting a strong CAGR of 38.6% during the forecast period. With this increasing pace, the region is anticipated to increase by 33.3% in terms of revenue share by the end of 2025. This growth is owing to the swift developments in infrastructure and flourishing manufacturing sector especially in countries such as India and China. Some of the global leaders are implementing nanotechnology-based coatings that help in cost-reduction, become scratch resistant, and provide support to antifogging. Few of the prominent leaders existing in the smart coatings global market include PPG Protective and Marine Coatings, 3M, Dow Corning, BASF SE, NEI Corp., Royal DSM, and Inducoat among others. Smart coatings are one of the coatings that are technologically developed to change its properties in response to the environmental stimulus. The product have been developed in such a way that they react to the stimulus on its own which is why it is named as smart coatings. Various smart coating products available in the market are self-cleaning, self-healing, anti-corrosion, anti-microbial, self-dimming and others. These coatings are been used for various applications ranging from building & construction, automotive, electronics, military, medical and others. The report estimates and forecasts the smart coatings market on the global, regional, and country levels. The study provides forecast between 2017 and 2025 based on volume (Tons) and revenue (US$ Mn) with 2016 as the base year. The report comprises an exhaustive value chain analysis for each of the product segments. It provides a comprehensive view of the market. Value chain analysis also offers detailed information about value addition at each stage. The study includes drivers and restraints for the smart coatings market along with their impact on demand during the forecast period. The study also provides key market indicators affecting the growth of the market. The report analyzes opportunities in the smart coatings market on the global and regional level. Drivers, restraints, and opportunities mentioned in the report are justified through quantitative and qualitative data. These have been verified through primary and secondary resources. The report includes Porter’s Five Forces Model to determine the degree of competition in the smart coatings market. The report comprises a qualitative write-up on market attractiveness analysis, wherein applications and countries have been analyzed based on attractiveness for each region. Growth rate, market size, raw material availability, profit margin, impact strength, technology, competition, and other factors (such as environmental and legal) have been evaluated in order to derive the general attractiveness of the market. The report comprises price trend analysis for smart coatings between 2017 and 2025. 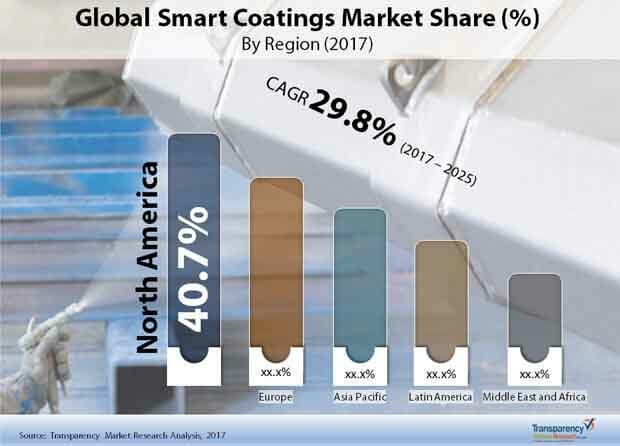 The study provides a comprehensive view of the smart coatings market by dividing it on the basis of applications and geography segments. The smart coatings market has been segmented into building & construction, automotive, electronics, military, medical and other segment based on application type. Application type segment have been analyzed based on historic, present, and future trends. Regional segmentation includes the current and forecast demand for smart coatings in North America, Europe, Asia Pacific, Latin America, and Middle East & Africa (MEA). Additionally, the report comprises country-level analysis in terms of volume and revenue for various segments. Key countries such as the U.S., Canada, Germany, France, the U.K., Spain, Italy, India, China, Japan, South Africa, Mexico, and Brazil have been included in the study. Market segmentation includes demand for individual applications in all the regions and countries. The report covers detailed competitive outlook that includes market share and profiles of key players operating in the global market. Key players profiled in the report includes 3M, Dow Corning, PPG Protective & Marine Coatings, Royal DSM, NEI Corporation, BASF SE, and others. Company profiles include attributes such as company overview, number of employees, brand overview, key competitors, business overview, business strategies, recent/key developments, acquisitions, and financial overview (wherever applicable).